Like any scientific investigation the search for an answer must explain what is observed. In the case Moon there are some very tight constraints on any model. These constraints come from observations and material returned from the Moon by the Apollo program. The return of these samples was a turning point in the development of a theory as it has effectively precluded all prior theories of lunar formation. The geochemistry and isotopic characteristics of these rocks are the fingerprints left on the Moon by its formation. This essay explores the various models of Moon formation. I will first detail the constraints on any model for the formation of the Moon. We will then explore the models proposed prior to the Apollo program before detailing what is now the cornerstone of our understanding of how the Moon was formed. We will also examine the effect that the Moon has and is having on the Earth. At the end a summary of the current thinking is provided. The dynamics between of the Earth-Moon system. The compositional differences and similarities between the Earth and Moon. The relative depletion of volatiles and isotopic signatures in rocks returned from the Moon. The moon is quite unusual in the Solar System (Canup, 2004a) At 1% of the mass of the Earth it has few comparisons in the Solar System, with only the Pluto – Charon system being comparable. The largest moons orbiting the other terrestrial planets are only about 0.01% of the planets they orbit. This tends to indicate a different mode of formation. However, this uniqueness may be more a result of a small number of examples. Stevenson (1987) points out that the Earth – Moon system may not be so unique. He argues that the there are few similar comparisons in the inner Solar System. Both Mercury and Venus may be too small and are affected by Sun-generated tides. The outer planets are mainly gaseous and their satellites are from different origins. For example, Jupiter’s satellite Io has a substantial volatile content where the Moon is deplete in volatiles. The angular momentum of the Earth-Moon system is comparably very high. If the mass of the Moon was brought to the Earth the planet would rotate in about four hours. This is a much shorter day than any of the other inner planets. An important feature of the Earth – Moon system is that the tidal bulge in the Earth created by the Moon is 10% ahead on the line joining the Earth and Moon (Freedman and Kaufmann p 249 – 250.) This results from the Earth rotating at a faster pace than the Moon orbits the planet. The mis-alignment creates a gravitational tug on the moon that lifts it into a higher orbit and increasing its sidereal period in accordance with Kepler’s third law. This will be explored in more depth in a later section. Reflectors placed on the Moon by a number of Moon missions have provided a method to confirm that the Moon is moving away from the Earth. By continually firing laser light at the reflectors it has been determined that the Moon is spiralling away from Earth at a rate of 3.8cm per year. This rate of distance increase is much higher than other systems in the Solar System (Canup, 2004a.) It is thought that in the initial stages of the Earth – Moon system the Moon was 15 times closer to the Earth and that the Moon was inclined at 10o to the Earth’s equatorial plane. As a result of the tidal induced friction between the oceans and the Earth’s crust the Earth’s rotation is slowing at a rate of 0.002 seconds per century. The Apollo missions brought back material from the Moon that provides important clues to the origin of the Moon. These rocks were found to be similar to Earth rocks but with an important difference (Canup, 2004a.) The rocks where found to be deplete in volatile elements (eg potassium and sodium.) These elements boil at a temperature of 900oC (Freedman and Kaufmann p 249 – 250.) Furthermore, the Moon rocks are enriched in refractory elements. Refractory minerals (eg calcium and aluminium) boil at temperatures greater than 1400 oC. The depletion of volatiles indicates that the matter in Moon rocks has been heated to temperatures greater than the rocks on Earth. The bulk composition of the Earth and Moon is different. The Moon has lower iron content with a smaller iron core than the Earth. Surveys conducted by the Clementine spacecraft found that the floor of the 12km deep South Pole-Aitken Basin has an iron content of 10% (Freedman and Kaufmann p 250.) At the same depth on Earth the iron concentration is 20 – 30%. An important consideration in the development of a model for the formation of the Moon is when it occurred in the Solar System’s development. A review by Halliday (2008) details earlier studies to date the formation of the Moon. The studies after the return of Moon rocks by the Apollo program did not result in an exact date for the formation of the Moon. Early Sb – Sr and U – Pb isotopic studies indicated that the Moon had formed by 4.45 billion years ago. This was very close to the age of the Earth given by lead isotope studies indicating that both the Earth and the Moon formed at the same time. Halliday (2008) proposed that the Moon formed late at 100 million years after the start of the Solar System. This solved a number of problems with the earlier isotopic studies and was in total agreement with Earth lead and xenon isotopic ratios. However, others (Jacobsen, 2005) maintain that the Moon formed as early as 30 million years after the start of the Solar System. Larger solid bodies began forming in the solar nebula at about 4.56 billion years ago (Canup, 2004b.) At the same time the solar wind drove of the hydrogen-rich gas after 1 to 10 million years. With accretion of smaller bodies larger proto-planets formed which developed elliptic orbits due to gravitational interactions. The elliptical orbits allowed bodies to collide and, if the conditions are correct, accretion could take place. If the collision velocity was too high then rebound, erosion or fragmentation would occur. With lower collision velocities accretion could take place. The larger bodies formed into proto-planets and collected smaller bodies due to their greater gravity. This planet forming period lasted between 10 and several hundred million years. Towards the end of the planet forming stage it is likely that collisions between lunar and larger sized objects occurred. The result of these giant collisions was to concentrate matter into a lower number of bodies as currently observed in the Solar System. This part of the development of the Solar System may have resulted is spectacular collisions between large bodies. The isotopic data firmly puts the formation of the Moon in the period in which the planets where forming from smaller bodies. Furthermore, it appears that the Moon formed at a time when giant collisions where taking place. The capture theory proposes the Moon formed within the Solar System and was captured by the Earth (Freedman and Kaufmann p 249.) It was envisioned that the Moon was in orbit around the Sun close to the ecliptic plane before being captured by the Earth. The major problem for the dynamics involved with the capture of the Moon is the dissipation of the Moon’s kinetic energy (ORIGINweb.) It has been proposed that the energy was dissipated over a period of time. However, this is deemed unlikely due the presence of similar sized bodies at the same time. These would tend to disrupt a capture and is more likely to increase velocity rather then decrease it. A more likely mechanism has been proposed for a capture theory. It would be easier for the Earth to capture swarms of smaller bodies from the circumsolar disk that collected, accreted and was heated to expel volatile elements (Freedman and Kaufmann p 250.) However, this still does not explain the iron depletion in the Moon and is dynamically unlikely (Canup, 2004a.) Furthermore, a separate mechanism to heat this material to a greater temperature than Earth rocks is required. Any capture model struggles to explain the identical oxygen ratios between the Earth and the Moon. A study by Pahlevan and Stevenson (1987) found that even a body captured that accreted near the Earth’s orbit should have some difference in the oxygen isotopes. This idea will be covered a little more in a later section. The co-creation theory states that the Earth and Moon formed at the same time but separately (Freedman and Kaufmann p 249.) The theory is that as the Earth attracted material during the planet building stage matter also accumulated and accreted to form the moon. It was proposed that the collision of planetesimals threw debris into orbit when they collided near the Earth (Ruskol, 1963.) In this model a disk formed in the equatorial plane. The material in the disk was sourced from nearby collision of up to100km wide bodies resulting in fragmentation. The resultant fragments possessed low levels of kinetic energy allowing their capture. The different sized satellites then collected outside the Roche limit to form the Moon. Ruskol envisioned that the Moon was originally located at between 5 and 10 Earth Radii. However, this theory does not explain the density difference between the two bodies. The Earth may have preferentially collected denser bodies but this does not explain the lack of volatile. The co-creation theory does not account for a number of factors (Canup, 2004a.) The theory fails to describe why the Moon is deleted in iron. Presumably the Earth and Moon would have attracted similar material. It also fails to account for the angular momentum in the Earth – Moon system. The accretion of matter tends to slow rates of rotation. It fails to explain why the rocks where heated to a higher temperature. Furthermore, it fails to explain the inclination of the Moon’s orbit to the equatorial plane without a separate mechanism (ORIGINweb.) Also, since this is an evolutionary process so why is this not evident with the other terrestrial planets? After deducing that the Moon was moving away from the Earth George Darwin realised that the Earth must have been rotating at a higher speed than currently (Freedman and Kaufmann p 249.) He postulated that the Earth was spinning so fast that mass tore off the planet to form the Moon. The idea is that Earth’s spinning so fast that a prominent bulge developed on the equator. With time this split from the Earth to form the Moon. This is known as the fission theory. This model accounts for the lower density of the Moon (Binder, 1974.) If the Moon formed from the partly differentiated mantle of the Earth it would contain a lower iron concentration. However, there are some fundamental problems. Calculations have shown that the Earth would have to be spinning at such a rate that a day would be 2.5 hours long (ORIGINweb.) There is no known mechanism that can account for such a high rotation rate. As previously stated the current angular momentum could produce a day of 4 hours. As with the co-creation model this model can not naturally explain the inclination between the Moons orbit and the Earth’s equatorial plane. Geochemical evidence is also against this model. The Moon is depleted in siderophile elements other than iron (ORIGINweb.) If the Moon originated from the still differentiating Earth the Moon should also contain more nickel and less of other siderophile elements than is apparently present. Also, the Moon contains higher concentrations of refractory elements such as aluminium, uranium and rare earth elements. The three models proposed before the return of material from the Moon had significant problems and seem unlikely. The common problem with them all is that they do not explain high angular momentum in the Earth – Moon system. Further processes where required to explain other characteristics raising doubts about the validity of the models. The study by Hartmann and Davis (1974) looked at the size distribution of gradually smaller sized bodies. It showed that bodies progressively got larger by sweeping up matter close to its orbit. As the bodies become bigger they accreted other matter more efficiently. As they grew the bodies may have been destroyed either by destructive collisions or being accreted be even larger bodies. At some point the Earth would have been the largest body near to its orbit and there may have been at least one other large body in a similar orbit. It was calculated that large bodies had formed close to Earth’s orbit within 107 to 108 years. As the bodies orbit the Sun they interact with each other to perturb each others orbits. This may cause them to enter an orbit on a collisional course with other large bodies. Another option is that the collision occurred as a failed capture. 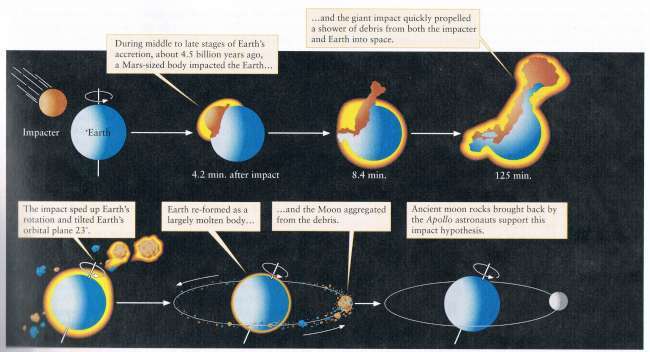 The study by Hartmann and Davis proposed that a large body hit the Earth giving rise to the Moon. As the Earth had partly differentiated the mantle was depleted in iron. It is also thought that the body that struck the Earth had differentiated. Thus the mantle material of both bodies contributed to the material of the Moon which is also depleted in iron. After the collision and formation of the Moon the remaining smaller bodies gave rise to cratering on the Moon. Similar cratering is evident on other planets. In the case of the Moon it appears that it was struck be bodies 32 – 95km during this stage. Mars is like to have been struck by an object 100km in radius. Cameron and Ward (1976) refined the work of Hartmann and Davis. They surmised that the location of the impact is a matter of chance. They proposed that a glancing hit rather than a direct hit better explains the result. At the time of the collision both of the bodies were differentiated and perhaps molten. Furthermore, the impacting body was Mars-sized. The resultant material’s trajectory was initially governed by gas pressure gradients as the material expanded into space. It is thought that most material was ejected forward. The hot silicates condensed into centimetre to metre sized objects early in the process. At a later stage the volatiles condensed into thin dust and escaped from the system. This process effectively depletes the material of volatiles and concentrated refractory material. The enormous amount of particles would then interacted with each other and formed a disk, with most material between 2 to 4 Earth radii. Outside on the Roche limit gravitational clumping would have taken place. It is thought that the Moon could have formed quite quickly in this fashion. Cameron and Ward (1976) found that this process was only valid for an Earth-sized body. If a similar process occurred with Venus the resultant satellite would have spiralled into the planet a long time ago. Stevenson (1987) details the aftermath of the collision. 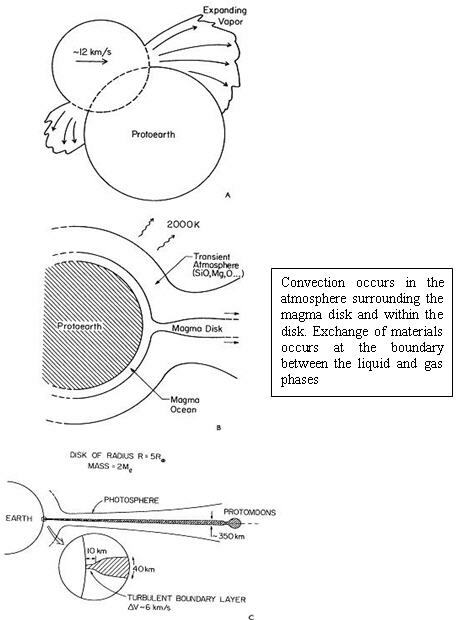 With the formation of the disk containing gas and liquid a photosphere surrounds both the disk and the proto-Earth. This photosphere was approximately 2000K and radiated infra-red radiation. The photosphere above the proto-Earth was underlain by a magma ocean. The disk was up to 350km thick with proto-moons forming outside the Roche limit (fig. 2.) The resultant Moon was at least partly molten to allow evolution including differentiation. The collisional ejection theory has a number of advantages over the previous theories Hartmann and Davis (1974.) As opposed to the fission theory it provides an energy source and is not evolutionary. As a result the lack of a similar system in the Solar System does not present a problem. It neatly explains the iron depletion, refractory enrichment and volatile depletion. Furthermore, it explains the relatively high angular momentum of the Earth – Moon system and explains the tilt of the Earth’s tilt to the ecliptic plane. However, there still remain some issues with the theory. Ringwood (1989) details some problems with this model. Due to geochemical signatures it was thought that a Mars-sized compactor did not contribute any material to the Moon. It appears that the material of the Moon was derived from the Earth’s mantle. It was proposed that the impactor did not directly produce the Moon but increased angular momentum. It was thought that the Earth was at about 70% of its current size. The material of the Moon was produced by the collision of high velocity 0.001 – 0.01 Earth-mass bodies. Material was injected into orbit without significant melting of the Earth’s mantle. Another issue with this theory is the similarity of the oxygen isotopes of the Earth and the Moon. If a single body impact resulted in the Moon then there should be a detectable difference in the isotopes (Pahlevan and Stevenson, 2007.) They state that the similarity is unexpected. Following on from the work of Canup (2004c) Pahlevan and Stevenson refined the model proposed by Ringwood (1989) to account for the similarity of the isotopes. Pahlevan and Stevenson points out that the highly similar oxygen isotope ratios between the Earth and Moon is unlikely. They state that large proto-planets would collect material from a wide zone in the proto-planetary disk. Isotopic differences should be measurable as indicated by the results of hydrodynamic simulations. The standard hydrodynamic modelling techniques suggest that the Moon is composed of about 80% of the impactor’s material. Due to the high concentration of this material in the Moon any isotopic differences should be evident. The isotopic influences of the impactor on Earth isotopes are diluted due the greater mass of the Earth and a smaller amount of material being added to the Earth. They state that there is no reason to think that this model is incorrect. To explain the similarity in isotopic ratios Pahlevan and Stevenson suggest turbulent mixing occurred (fig. 2.) In this model it was proposed that immediately after the collision of a Mars sized body a disk of molten material formed. The surface of the planet was covered with a magma ocean. Both the proto-Earth and disk were encased in a silicate vapour-containing atmosphere. Mixing occurred in the disk before accretion of Moon matter occurred. At the same time as the mixing the system radiated away heat. This took place over 100 to 1000 years. This mixing resulted in the exchange of atoms between the gas and liquid phases leading to the equalisation between the Earth derived materials and the impactor derived material. Pahlevan and Stevenson recognise that the lack of water in Moon rocks presents a problem for this model. They note that there should have been transport of water into the disk. They suggest that the dissociated hydrogen and water were driven out of the disk by hydrodynamic wind. The system remained closed for silicate material in the disk. In reply to the work of Pahlevan and Stevenson Melosh (2009) notes that the model is not complete. With the exchange of matter between the Earth and disk there should also be a distribution of angular momentum. The model fails to provide a mechanism for that to occur. With the formation of a disk, presumably on the Earth’s equatorial plane the collision theory fails to explain the current inclination of the Moon’s orbit to the equatorial plane. As previously stated the Moon is moving away from the Earth at a rate of 3.8cm per year. We will now look at why this occurs and how it will develop in the future. With the tidal bulge caused by the Moon being ahead of the Earth – Moon line angular momentum is transferred from the Earth of the Moon (Arbab, 2003.) Energy is dissipated due to friction within rocks in the Earth’s crust and friction between the oceans and the underlying material. As a result of this the Earth’s rotation is slowing and the Moon moves into progressively higher orbits. To preserve angular momentum the Moon’s orbital speed decreases. Conversely, the length of Earth’s day was shorter in the past. As the tidal bulge the Moon creates in the Earth is ahead of the Moon a force is applied to the Moon. The force is the result of the slightly great collection of mass in the bulge leading to a higher gravitational force (fig 3.) This is the force that tugs on the Moon and transfers angular momentum. It has been pointed out that the current rate of separation is too high (Finch, 1982) and would have been unstable 1.5 million years ago (Arbab, 2003.) This indicates that the tidal coupling must have been less in the past. However, evidence shows that the rate of separation has been constant for the past 360 million years. One explanation for the changing tidal coupling is the changing nature of the World’s oceans due to factors such as the changing depths of oceans and glacial cycles. 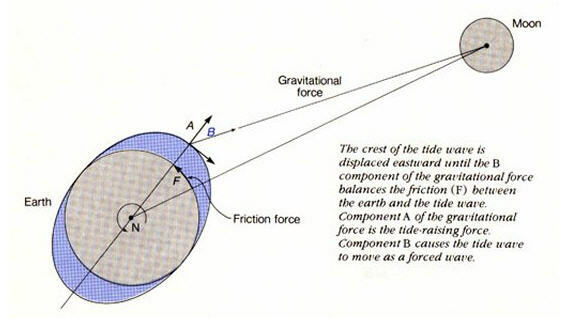 In the same way that the Earth’s rotation is slowed so did the Moon’s after it was formed (AEROweb.) As the Moon is smaller than the Earth its rotation stopped after about 50 million years and is now in synchronous rotation. Therefore, the Moon rotates once every time it orbits the Earth keeping the same face towards Earth. The development of theories proposing how the Moon was formed explored in this work began in the early 1900’s when George Darwin proposed that it was the result of a fission process. Prior to the Apollo program the capture theory and the co-creation theory were also seriously considered. However, all three theories had serious problems with certain observations. After the return of rocks from the Moon geochemical and isotopic data cast further doubt on the earlier theories. Today the collisional ejection theory is accepted by most as being the best model. There are however some problems to resolve and work is still ongoing. The collisional ejection theory tells us that the proto-Earth was struck off-centre by a Mars sized body. This occurred towards the end of the planet forming period when the planetesimals had collected into a relatively few larger bodies. The impactor may have been previously disturbed from its orbit by the Earth and may even have been the result of a failed capture. The collision imparted an enormous amount of energy onto the Earth increasing its angular momentum and tilting the axis of rotation to the ecliptic plane. The interaction of the differentiated mantles of the Earth and impactor vaporised material that was injected into Earth’s orbit. This material then interacted and formed a disk of molten material on Earth’s equatorial plane. The enormous amount of energy imparted on the Earth would have ensured that at least some of the surface was molten and a magma ocean may have developed. Enclosing both the Earth and disk an atmosphere rich in silicates developed. While the system cooled mixing between the Earth and disk (facilitated by a common atmosphere) allowing isotopic equilibrium to be established. After equilibrium was established the Moon formed outside the Roche limit. This model successfully accounts for most of the observations and measurements. However, there are still some problems. The process that develops isotopic equilibrium does not explain why angular momentum was not redistributed at the same time. Also, the model does not explain the tilt of the Moons orbit to the Earth’s equatorial plane. For a short video on the Collisional Ejection Theory you can look here. Binder, A. B. 1974, Earth, Moon and Planets, 11, 53. Cameron, A. G. W and Ward, W. R. 1976, Luna Sci., 7, 120. Canup, R. M. 2004a, Annu. Rev, Astron. Astrophys, 42, 441. Canup, R. M. 2004c, Icarus, 168, 433. Finch, D. G. 1982, Moon and the Planets, 26, 109. Freedman, R.A. & Kaufmann, W.J., Universe, 8th ed. (W.H. Freeman & Company, NY) 2008. Halliday, A. N. 2008, Phil. Trans. R. Soc. A, 366, 4163. Hartmann, W. K. and Davis, D. R. 1974, Icarus, 24, 504. Jacobsen, S. B. 2005, Annu.Rev. Earth Planet.Sci,.33, 531. Malcuit, R. J.; Mehringer, D. M.; Winters, R. R. 1989, Abstr. of the Lunar and Planet. Sci. Conf, 19, 718. Melosh, H. J. 2009, 72nd Annu. Meeting of the Meteoritical Soc., published in Meteoritics and Planet. Sci. Suppl., p.5104. Pahlevan, K. and Stevenson, D. J. 2007, Earth and Planetary Science Letters, 262, 438. Ringwood, A.E. 1989, Earth and Planetary Science Letters, 95, 208. Ruskol, E. L. 1963, Soviet Astron. – AJ, 7, 221. Stevenson, D. J., 1987, Ann. Rev. Earth, Sci, 15, 271. Wise, C. U., 1963, J. Geophys. Res., 68, 1547.